Volunteer mechanics aid aviators in distress. 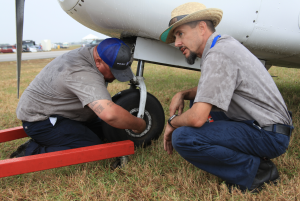 The Double M Aviation tire change crew, Chris Gallant, left, and Michael Bowen, at work during Sun 'n Fun. (photo by: Jeremy King). If you fly long enough, you’re eventually going to have an airplane break when you’re far from home. 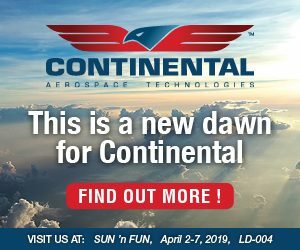 When you scale up the factor to the level of the Sun ‘n Fun Fly-in, statistically there will be a lot of airplanes needing the loving touch of a mechanic’s hand before they can fly back home. In a little gray shed off the warbird parking area, a group of volunteers are taking a moment off. This group is composed of mechanics, inspectors, pilots, and folks who’ve been tinkering with flying machines their whole lives. “When we’re bored and idle, everyone else is having a good day. 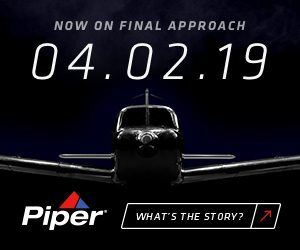 If we’re busy, there’s a lot of pilots who are not so happy,” says Ed Stark, chairman of the Emergency Aircraft Repair crew. The volunteers come from near and far to lend a helping hand to pilots in need. “We basically have tools that we can loan out and we offer assistance. Some pilots are mechanics, or can do their own preventative maintenance. Some need more assistance than others,” Stark said. The volunteers don’t charge for their services. It’s literally a helping hand fueled by mechanics as passionate as the pilots who make the journey down here. They’ve helped with minor maintenance squawks as well as helping to move a few disabled aircraft. But please, don’t come to Lakeland in your wheezing, coughing bird expecting to get a complimentary overhaul. The volunteers try to keep their services toward the simpler fixes. 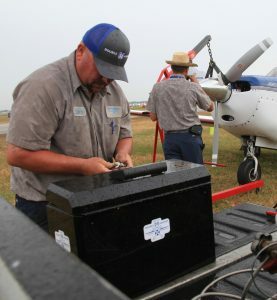 If you find yourself with a wounded bird in need of intensive care, you might cross paths with the crews from Double M Aviation, a maintenance shop here on the field. Out on the flightline, Chris Gallant and Michael Bowen loaded up a hoist to change the tire on a Piper Comanche. Normally, a simple jack could lift the nosewheel, but the sandy soil here makes that a bit of a challenge. It’s easier and safer to use a hoist with a bigger footprint on the ground. Rain pelted them as they worked, but they didn’t seem to notice. Liquid air conditioning, if you will. As they worked, they talked about some of the other stuff they’d seen in the week: Flat tires. Struts needing service. Oxygen tank refills. “One owner had bought a case of oil and wanted to borrow a bucket so he could do an oil change out here in the field,” Gallant said. Another owner had a vacuum pump fail. He walked over to a vendor’s tent, got a deal on a replacement, and had it installed just hours later. In the grand scheme of things, there are much worse places to be stranded with a busted airplane than Lakeland, Florida, this week. Chris Gallant of Double M Aviation helps Sun 'n Fun visitors keep their birds maintained while at the show. (photo by: Jeremy King).